As hot summer days begin to stretch out before us, there’s nothing quite like the taste of watermelon. It’s cool, crisp and refreshingly sweet. The best part about it is that it’s even got a healthy boost of vitamins and fiber. It’s a great snack for kids to munch on, especially when there are seeds to spit! This Fourth of July, try making this patriotic fruit platter that is not only festive but nutritious and delicious as well. This no-cook recipe is great for any age, but for kindergartens who are working on developing their fine motor skills, this is an especially fun project. To make your watermelon-blueberry platter, your child will use cookie cutters and kabobs, and she’ll practice the “pincer grip” that will help her later with handwriting. This is a recipe that friends and family will definitely enjoy! Before you begin, make sure you have washed your fruit thoroughly, including the outside of the watermelon. For this dish, you will be using the rind as well as the flesh of the melon, and you’ll need to make sure that everything is clean! Use a sharp knife to cut the watermelon exactly in half, making two bowl shapes of watermelon. Then place one half on a table, so that the flesh is facing up, and use the knife to dig around the edge of the flesh, and separate it from the rind. Try to remove the flesh in one big chunk—or as big a chunk as possible! Then slice the watermelon flesh into large circles, each about ¾ of an inch thick. You will be left with one half of the watermelon with the flesh and rind intact together, the watermelon slices, and one round bowl of rind. Turn the rind over so that it makes a dome, and place it on a platter lined with fresh mint. Put it aside—you’ll be using it soon. The remaining half of your melon will be cut up as well, but this one will be a little easier, because you don’t need to keep the rind “dome” intact. For the second half, cut your watermelon into circles, rind attached. Each circle should be about ¾ of an inch thick (for this recipe, it’s better to make them thicker, not thinner if you’re unsure of the size). Then use a sharp knife to cut off the rinds, leaving a circle of juicy red watermelon intact. Now’s the time for your child to get in on the action! Lay all of the watermelon circles on a clean cutting surface and invite your child to use the cookie cutter to cut the flesh into star shapes. For your young learner, this is a great time to point out some early lessons in spatial thinking: many star cutters can “tessellate,” i.e. their points can be lined up side by side to make a repeating pattern—which will minimize your watermelon waste. See how many complete stars your child can make from one watermelon circle. You can expect to end up with some scraps, so feel free to munch on these along the way. When you and your child are done, you’ll have a lovely array of bright pink watermelon stars. Take out your skewers and have some fun! Help your child run a skewer through each star (through the length of the star rather than the width), leaving at least a half an inch at the top for people to grab. Make sure the pointed end of the skewer ends up on the bottom. Use the pointed end to poke the hole in the watermelon. 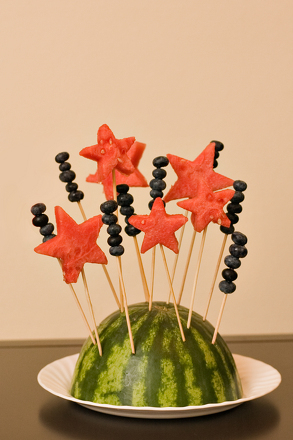 Keep going to create a ton of watermelon star skewers! You can put as many watermelon stars as you would like on one skewer, depending on the size of each skewer and the size of your stars, but 3 or 4 should be the maximum amount for one any skewer. Help your child stick the watermelon skewers into the melon dome on your platter. You and your child can arrange them in whatever design you like. When you and your child are done, you’ll have a simple, yet festive platter of delicious and healthy summer treats to serve at your next Fourth of July party. It’s sure to be a real crowd pleaser! 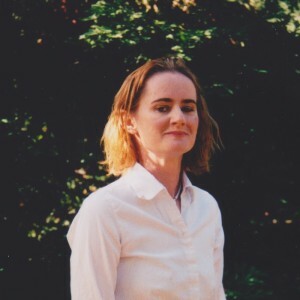 This entry was posted in Food, Recipes by Kitty Kate. Bookmark the permalink.